Here is a review of what Dr. Katz had to say. He told the neurologist attending this meeting that we should stop worrying about the cost of the treatments; there is always the H.M.O. to take care of this issue. So let the HMO worry who can get IVIg . Following tests for neuropathy are not needed, (antibody screens, neuropathy panels) the cost of these screens varies from 1500 to 2000 dollars and then one does not know what to do with the result. Sedimentation rate should be done along with a B12 level as you can diagnose vasculitis or vitamin deficiency based upon the results. No nerve biopsy should be attempted; this will leave the patient with a life long sensory deficit (Do Not Cause Any Harm) Hippocraties. Biopsy is useless in patients with CIDP as they have skip lesions, which cannot be seen on a routine biopsy. Some patients have motor involvement and the sural biopsy will not show this. 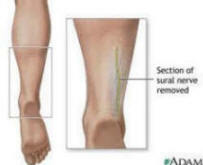 Because sural nerve is a pure sensory nerve. The diagnois should be based upon clinical examination. Finally do not follow any guidelines to make a diagnosis. As only 20-30% of the patients will fit the AAN guideline. Patients will come in with different presentations. EMG/NCV can be normal if only small fibers are involved, or show axonal or demyelinating pattern. Thus you cannot depend upon the EMG/NCV to diagnose CIDP. So the best test to prove that patient has a immune neuropathy is to treat them with IVIG. Those that report improvement should be considered as suffering from immune neuropathies. Usually you will not see a improvement in their examination after they have been treated with a course of IVIg. If the patient states that they have been helped then its best to document this. Steroids will not improve axonal conditions like M.M.N. They may help CIDP patients but will take 2-3 months to see a response. Dr Katz has published several papers on CIDP and he wrote the Medicare guidelines for CIDP in California. From the Departments of Neurology, Palo Alto VA Medical Center and Stanford University (Dr. Katz), Palo Alto, CA; University of Kansas Medical Center (Dr. Barohn), Kansas City; University of Texas Southwestern Medical Center (Drs. Kojan, Wolfe, Nations, and Saperstein), Dallas; and Brigham and Women�s Hospital (Dr. Amato), Harvard Medical School, Boston, MA. Background: Conduction block is considered an essential finding for the distinction between motor neuropathies and lower motor neuron disorders. Only a small number of reports describe patients with multifocal motor neuropathies who lack overt conduction block, although in these cases other features of demyelination still suggest the presence of a demyelinating disorder. In contrast, a purely axonal multifocal motor neuropathy has not been described. Methods: This report describes nine patients with slowly or nonprogressive multifocal motor neuropathies who had purely axonal electrodiagnostic features. Results: GM1 antibodies titers were normal in all nine cases. Six patients were treated with either prednisone or IV immunoglobulin and three showed convincing improvement. Conclusions: These findings suggest an immune-mediated motor neuropathy with axonal electrophysiologic features that appears to be distinct from both multifocal motor neuropathy and established motor neuron disorders. Neuropathies are a significant cause of morbidity worldwide, mainly from diabetes mellitus, HIV infection and leprosy. Many are treatable with immunosuppression or intravenous immunoglobulin. Tight glycaemic control slows progression of diabetic neuropathy. Even when the underlying disorder is untreatable, making a specific diagnosis and appropriate management to avoid complications and neuropathic pain can be rewarding. The simplest treatment for any neuropathy or CIDP is a gluten free diet, 30-40 % diseasefor reversal. See our celiac section of cidpusa website. We provide cures for ailing humanity.